I have recently made a discovery that my hog head is leaking, and there is a hairline crack that goes from the corner bolt (under the exhaust -on the passenger side) vertically up about 3 inches. What do you recommend I try to repair this with without removing the hog head? Clean it very well. Grind or rough sand the surface around the crack to bare metal to get some tooth. Apply JB Weld. Not the quick stuff but the stuff that takes 24 hours to cure. The repair may last for a couple of years depending on what caused the crack in the first place. Meanwhile, find a used hogs head and get ready to replace the cracked one. Your hogsheads could be removed and a permanent repair be made by welding or brazing. You can find another good one as they are still fairly plentiful. I think I would find another and do a repair as Neil says if you want to keep driving it while you look for another replacement. But I wouldn't throw the cracked one away. It's still good enough to save and repair. 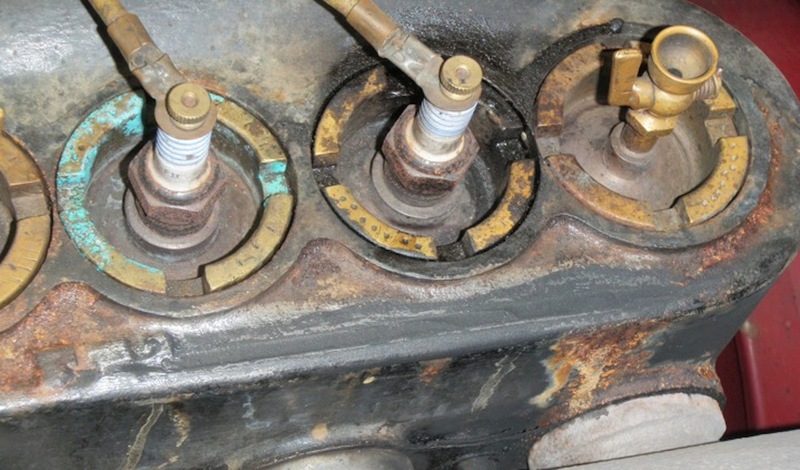 That area tends to crack because of the tension of pulling down on the felt seal around the back of the block and the bolts holding it to the crankcase. You need to be very careful to fit the felt seal, usually need to make it a bit thinner than it comes in the set. Then use a lot of gasket sealer on the felt seal especially in the corner where the block and hogs head come together. When you tighten the bolts around the crankcase, do the ones in the corner last. 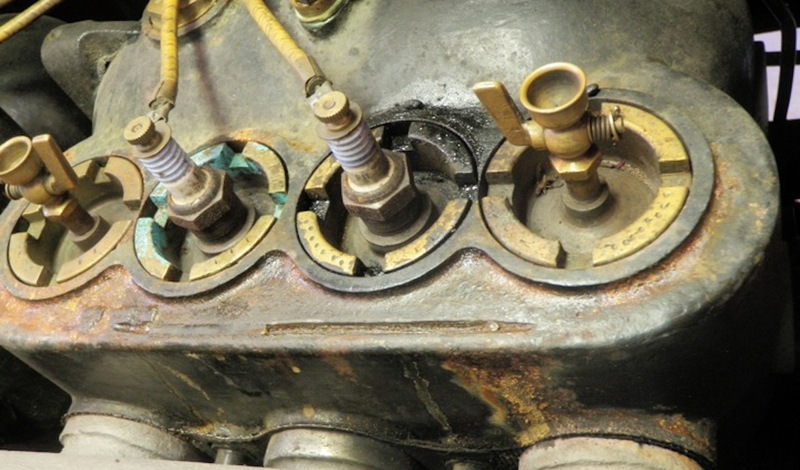 Start in the center and work out toward the ends somewhat like tightening the head gasket. Just snug them up one at a time and start in the middle again and tighten some more with the ones at the corners last each time until they seem to be tight all the way around. Your crack is in a place which gets a lot of tension and I personally don't think you will get a satisfactory fix without welding it or replacing the hogs head. If you replace the hogs head be sure to check the condition of the low cam and low notch and replace if worn or you will have trouble with low gear. Years ago,I had a Troybilt mower that leaked oil badly. When I took it apart I found a long crack in the bottom of the crankcase. After V-ing each side of the crack, I used #10610 Aluminum Devcon epoxy putty mixed 4:1 and filled the crack. I had that mower for 25 more years and it never leaked again. Gasket sealer like permatex on surfaces and locktight on bolts is what I do but fixing broken metal requires welding to do it correctly and permanent. Restoration is not building plastic model cars with glue and epoxy is not factory. It will fail eventually where metal infused is a real repair. Someday someone will have my cars and they won't say that I didn't know what I was doing and glued broken metal together. A "skim coat" of epoxy is not a repair of cracked metal, it won't rust but WILL pull away and fail unbounded to the parent metal. I would expect a non-flexing hard material like epoxy to pull away eventually as Tim suggests, and has been my experience in years past. On the other hand, Jim and others have used it successfully so it certainly can work. If it were me, I would first clean the surface down to bare cast iron then scuff the surface for more tooth. Second � and only if the end of the crack is accessible � I would drill it to prevent the crack spreading. After this preparation I would coat the repair area liberally with Permatex Right Stuff. 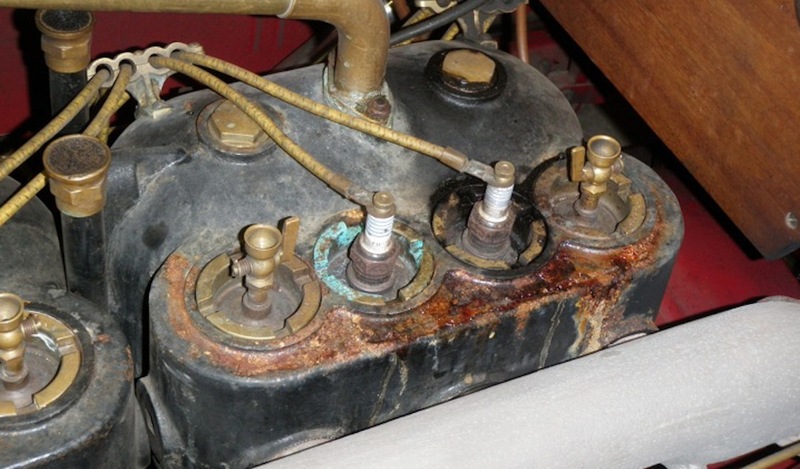 You might choose to put a thin brass shim patch over the repair as shown in the photos below. In my books, this stuff is "Miracle In A Tube". I've used it to seal cracks in T blocks, water jackets, radiator tanks and even a rust-out pinhole in an air compressor tank (for that one the Right Stuff was the adhesive that held on a metal patch). Temperature resistance is fine for all these applications and there is enough flex that heating/cooling and a bit of crack growth is no problem. An alternative to Right Stuff is Permatex Ultra Black � While I've never used the stuff, Gene Carruthers swears by it and he's a pretty smart cookie. 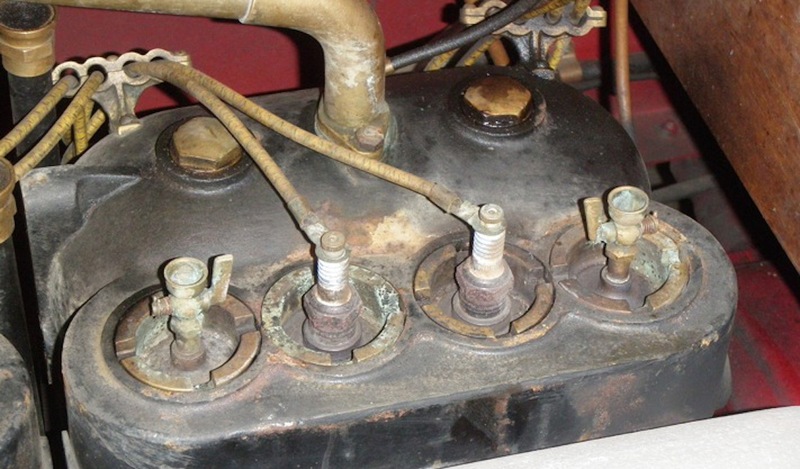 The photo sequence below shows Right Stuff used in the sealing of a water jacket crack in my 1912 KisselKar. This latest repair replaced the previous epoxy repair that failed after several years and has now held for several thousand miles. Chris, I love �The Right Stuff� almost as much as much as I love �Aluminum Devcon�. We used Aluminum Devcon in the machine shop of the railcar repair facility where I used to work, to repair broken cast components such as gear boxes and re-lining and repairing hydraulic cylinders of very expensive obsolete power equipment of which replacement parts cost a fortune, or were no longer available. Jim Patrick is right. Devcon would probably work just fine. For now, you can smear a sealant on it. Next band change, drill a hole at the end of the crack and either V and Devcon or drill many holes and pins, or metal stitching things, or weld if you're daring. There's a nice 26-27 hogshead going to Hershey, pedals and all...just sayin. Chris, Thanks for the complement, You most likely overstated my sharpness lol, I do believe as you and many others that the Permatex ultra black and right stuff is near miracle stuff. It's hard to beat a successful long lasting repair. You showed one way to repair a crack in a cast iron casting that will more than likely out last anyone reading this thread. NICE pictures!! The problem I have experienced with the epoxies is that they cure and allow no flexibility. During some recent research I discovered the Devcon product that I have used as a Millwright at a paper mill has a lower working temperature than the JB Weld product. 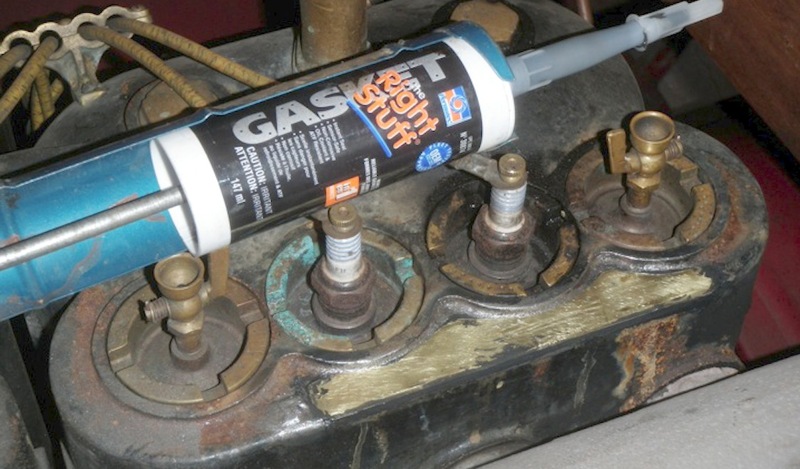 Tim, Yes I agree with you that using glued on patches is not the ultimate permanent repair method But in many cases it sure is a viable solution to fix something when the other option is a engine or major part removal and great expense with long down times. Since we're discussing Ultra Black and RS products I can't believe how many uses there are for them. 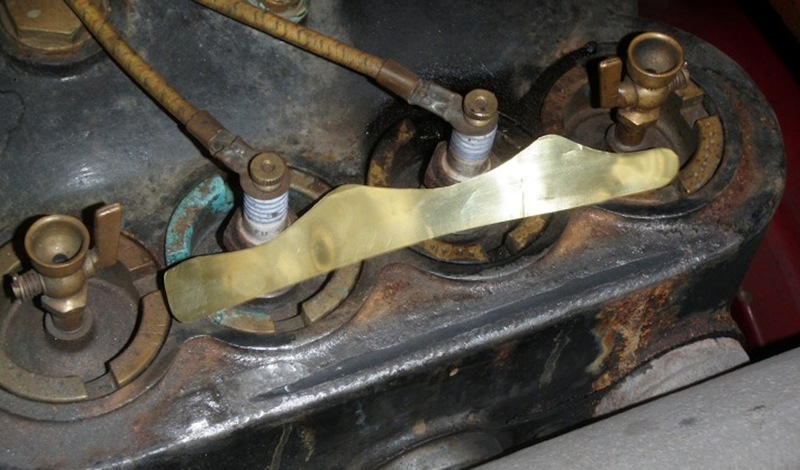 One really great one is for patching a tear on the top material, as a wear bumper under the hood lacing area on the radiator, gluing the modern crankshaft seal to the front of the engine, gluing a tail light lens or quieting a rattle, adhering almost anything and of course sealing leaks! Yup, I'm always amazed what new uses I find for the stuff.